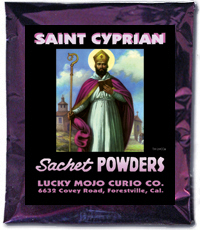 I've decided to work with Saint Cyprian (if he'll have me) , in hopes he can guide me in my work (Hoodoo and other stuff). I don't know however what his preferred day and payments are, and so far, searching online and in different Hoodoo themed chat groups online has yilded no results. Can anyone provide me with some info? Nagasiva is our resident Saint Cyprian go-to-guy, so i will ask him to respond to your post as soon as he has some time. i know we both are appreceative for your help. One more question I want to ask I am or want to use his oil,statue and card at the site where I am doing the 2 spell kits and candle spell I ordered from LM will this be too much with the other things I am already doing and how are they used to help enpower your spell.Thank you very much for having this person respond. "He is celebrated on the 16th of september as well as the 16 of june or august. this saint likes fine and expensive things, art and music, good food. He prefers having a few good things as opposed to many bad things." (my translation) I am not sure what this means but I guess he is picky with his offerings. He is generally recognized (along with Saint Roque) in combating plague, he is used to submit and banish demons, to attract money and find treasures, and to experience supernatural contact. He is also known to help those who are imprisoned (for he was persecuted and jailed in his time), to help those who are in need (it is said he ordered that his executioner receive a reward) and, according to many accounts, was a famed black magician in his youth. The story goes that a man went to him and asked that he use magic to ensnare a beautiful young virgin. When Cipriano saw her, he fell in love with her and used his magic to get her for himself. The woman was a devout christian, and cipriano found that his spells were useless against her. this led him to accept the superiority of Christ over his black magic. many prayers for (and IMO, by) St Cipriano are to be found in the Cruz de Caravaca (the Cross of Caravaca), a Catholic grimoire. I think it is to Spanish catholics and magicians what the Long Lost Friend is to hoodoo workers. It contains many spells and conjurations. many prayers to san cipriano ask for forgiveness and are powerful banishments/exorcisms. the most famous spanish language grimoire is named after him (El Libro de San Cipriano). It contains material from La Gallina Negra (The Black Pullet) and La Clavicula de Salomon (the lesser key of Solomon). "was a famed black magician in his youth"
"...he is used to submit and banish demons, to attract money and find treasures, and to experience supernatural contact." I don't know what you mean by "strengthen spells." St. Cyprian of Antioch is called on by some to help them learn magic. He is the patron saint of magicians. 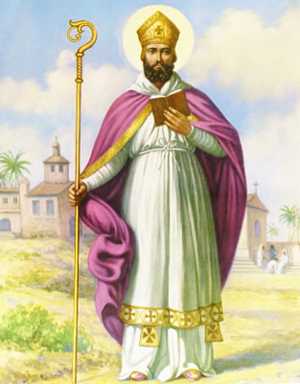 St. Cyprian of Carthage has become entwined with the other St. Cyprian in Latin American countries. St. Cyprian of Carthage is patron saint of Algeria. Do you feel called to work with St. Cyprian? Do you feel a connection with him? Don't work with a saint just because others do. Not everyone works with saints and not all of us work with all of them. There are many saints I do not work with, so a lot of this is individual choice. I don't know however what [San Cipriano's] preferred day and payments are, and so far, searching online and in different Hoodoo themed chat groups online has yielded no results. I can't say that i have fared much better. I am beginning to wonder if people give him offerings. apparently it was originally written in Portuguese, and it has been translated into Spanish. it is supposed to have been written after his death, but was attributed to him post-humously. for this reason there are really 2 foci of interest: the San Cipriano of the Christian stories and the author of the grimoire. I have not yet verified what it contains but will watch for this content, thank you very much. it has not yet been published in an English translat, but i am consistently asking friends online who know Portuguese to consider doing one. I know there was one done, parts of which were online as excerpts, but my email to the translator has not received response as yet. maybe we should ask Joseph Peterson to do it. I was taught to work with St, Cyprian, or St. Cypriano, as I was taught, when someone has cursed you unjustly. If someone has put a curse on you that is undeserved, St. Cypriano is your guy. I worked with him for such a situation and he did wonders. if you were taught to work with him, what were you taught to offer him in return for his efforts on your behalf?? Mary, you have offered the most coherent and informative data on Saint Cyprian of Antioch thusfar, thanks for your posting. I understand that there is a divergent set of stories surrounding this saint, and one of them (the Catholic story) is as you have put it. another is that he was a devout Christian and continued to use magic all the days of his life even for Christian ends (and thus his grimoire contains Christian spells). another is that he was never really converted and was a pagan disguised as a Christian. why he might be considered 'the patron saint of magicians' is very odd. my conclusion is that there is a 'pseudo-Cyprian' who lived after the man from Antioch, and this was the one who wrote the grimoire or put it together (if it was a composite of other texts as is sometimes alleged). I have begun to try to contact this pseudo-Cyprian through a candle working that i have initiated with a modified pagan Cyprian design featuring my own face instead of the saint's and certain refinements and changes to the religious symbolism. my experiments therefore are not truly in line with what would be said of saint Cyprian of Antioch, and therefore Reynolds and Sharon should not count on my input for that (moreso on Mary's or someone who understands the difference between Cyprian of Carthage and Cyprian of Antioch -- the two are often confused). I would ask the Catholic church if it endorses this saint is 'the patron saint of magicians' -- i doubt it strongly. this sounds more like a folk Catholic tradition, which means that there is a lot more here than meets the eye. thanks for this thread. it is very interesting to me and i will watch it closely and post more if i find out more information. Thanks for the clarification. I can only speak as to what I know. As far as the traditions I am familiar with go, San Cipriano is one guy. And yes, you do not see his name very often. In Mexico he is popular, but I have never heard of a church named after him. In PR he is regarded as the author of his grimoire and one of the worst storms of the last century was named after him. Aside from that, you do not see him much, except in the Cruz de Caravaca which contains three prayers to him and some spells that IMO could only have come from a sorceror, not a catholic priest. In Lydia Cabrera's "El Monte" in the entries for marjoram and cypress, Lydia Cabrera there is a description of how highly regarded was the book of San Cipriano among Afro-Cuban Paleros. The only "work" I am aware of involving San Cipriano is use of his grimoire. My sense is that he is approached with some trepidation (and rightfully so, I don't consider him one of the more [for lack of a better term] "user-friendly" saints, viz a viz St. Anthony, for example) in many parts of the Caribbean. As I mentioned before, I am not too familiar with this area of magic. I have not read the book of San Cipriano cover to cover (I have read the Greater Key of Solomon) so I cannot amplify on what Cabrera was being told by her informants. But I hope this helps. Is anyone familiar with Saint Cipriano? What is his purpose and how to thank him if he provides what you ask. Thanks in advance. 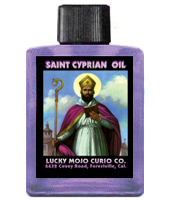 So St cyprian (cipriano) -- does he aid in protecting magicians and the occult since he is the patron of the magicians? I am speaking of the candle that lucky mojo sells. Also, can he help aid in the power of a spell if we petition to help with a spell. So St cyprian (cipriano) does he aid in protecting magicians and the occult since he is the patron of the me agicians. I am speaking of the candle that lucky mojo sells. Also, can he help add in the power of a spell if we petition to help him with a spell. For people that have used him, what have you used him for? Well saints can be kinda broad in terms of what within their area of patronage they can do. I would say that yes St. Cyprian would protect a magician, but I have never worked with him, that's just my thought on the matter. By the same token I would think he could be of aid in lending power to a spell but again I don't know. I recommend building a relationship with him and kinda feeling out what he can help you with. Also we don't use saints, they are not tools to be utilized and put away. They are spiritual beings and allies. We can petition a saint and ask for their help and that they may intercede with God on our behalf, but its up to them whether or not they help us. I think too much was looked into the word USED. My connotation of the word used in this reference did not mean a tool that can be utilized and put away. I know that saints are spiritual beings, and are not merely tools. I am very very well aware of that. Next time I will say work with to better explain myself, and to avoid words being taken out of context. Sorry, I was hoping I didn't come off as mean. I was told that St Cypian is called upon when one is doing works with La Santísima Muerte. St Cypian is a protector of some sort for magicians and help keep other spirits/saints in control if anything goes out of control and keep you safe. was a heathen magician of Antioch who had dealing with demons. By their aid he sought to bring St. Justina, a Christian virgin, to ruin; but she foiled the threefold attacks of the devils by the sign of the cross. Brought to despair Cyprian made the sign of the cross himself and in this way was freed from the toils of Satan. He was received into the Church, was made pre-eminent by miraculous gifts, and became in succession deacon, priest, and finally bishop, while Justina became the head of a convent. Perhaps because of his dealings with magic prior to his Christian conversion, Cyprian of Antioch would become the unofficial "saint" of magicians and have at least two works pseudoepigraphically attributed to him, O Antigo Livro de São Cipriano: Capa de Aço (The Great Book of Saint Cyprian) which is popular in Latin and South America and his name is also mentioned in Verus Jesuitarum Libellus (The True Petition of the Jesuits), a small grimoire dealing with conjuring spirits for monetary gain. Personally, I've only recently become acquainted with him and don't have much experience other than having started invoking him through ejaculatory prayer prior to working with goetic spirits - not hoodoo but I figured I'd throw it out there as an example of applied saint work. Lately I've been thinking about making a wood-block print to paste on a novena candle and see what he has to share. I looked through the previous forum discussions regarding St Cipriano and only found a few things so I am creating a new thread. I had a reading done by a rootworker who towards the end of the reading told me I should work with St Cipriano. The call was cut short so I was not sure why I would be instructed to use him and since then have been researching the whys and hows to using him. If anyone could shed some light on how to use him and what circumstances you would use him I would really appreciate it. St Cipriano is the patron of magicians and occultists. He is also often invoked for protection against baneful magic when it is directed at you, whether or not you are a worker yourself. So, you can either petition him to help you in your magical work, help you be a more powerful worker, etc. &/OR you could petition him to help protect you against being crossed or psychically attacked. Do either of these fit your situation? Thanks for the reply. At the time of the reading she said that someone awhile back had put something on me, but that it had been a long time ago. She said they must have used dirt as that is what could could smell at the time of the reading. We were starting on the conversation of how to use him when the call ended and that was the end of the reading. As far as now I could use him both ways. I am just not sure what is the best way to engage him, offerings (read he like the finer things in life ..art, food flowers etc). I am not sure what color candle to use, if it is acceptable to light a candle for him 1x a week, several times a week or to use a novena candle. Most of what I have read replicates what is here in archives and the forum. There is not too much. Also when is it acceptable to call upon him, what he does not like etc. I try to be thourgh in researching when I am going to call upon someone for their help. No sense upsetting them by doing things wrong if I do not have to. Also since he is the patron saint of magicians I am a little leary. I was hoping that someone who previously used him would share their experiences and perhaps share his likes and dislikes. Thanks! I would use purple with him as it's a power issue. I have heard that he enjoys having the trappings of the occult around him - charms, talismans, grimoires, etc. I haven't personally heard of him being particularly challenging to work with re: demanding, aggressive, "hot", etc. I would just get a picture of him, light a candle with his oil on it, and ask him to make his presence known in your life in a peaceful way, or otherwise give you a sign if he is willing (or not) to work with you. Then once you are aware of his presence ASK HIM what he wants in exchange for working with you. Most spirits will be more than happy to tell you what they like, etc. Thanks you so much for the reply and advice. It is very much appreciated! Devi gave You great answer. Maybe You could only LIt another , white candle and dress it with LM Spirit Guide oil. Just to give spell an extra power. who is the patron saint of rootworkers? hi all. could anyone tell me who is the patron saint for rootworkers and how to petition him/her???? Re: who is the patron saint of rootworkers? 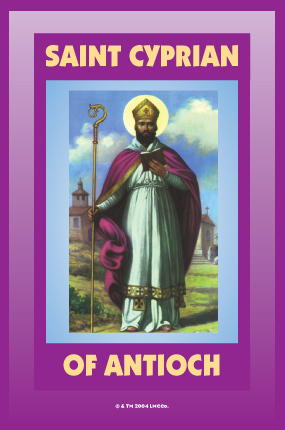 Saint Cyprian is the patron saint of occultists and spiritual workers. I don't know much about petitioning him specifically, his page on LM is here http://www.luckymojo.com/saintcyprian.html but has little info. I would use an LM fixed novena for him, place with it a glass of water and an offering, fix my petition with an oil and powder for my purpose- perhaps Master Key. I hear he likes trappings of the occult around him so perhaps you could incorporate them into his altar space and/or offerings. thank you! i never even heard of this saint before. hi. is his name pronounced SIE-PER-EE-AN??? This is great to know...has anyone petitioned St. Cyprian? Sip-pree-en, or in some Latin countries you see "Cipriano" sip-ree-ah-no. What is a Saint Cyprian candle used for? St. Cyprian is the Patron of occultists and spiritual workers. HailDiscordia wrote: St. Cyprian is the Patron of occultists and spiritual workers. He's called upon some to deal with various spirits, to reverse back evil spells, to help protect one from the oppression of other magicians, and can be called upon to assist in magical workings. I reall need help with a situation but I also have a question about St. Cyprian. I bought the vigil candle for St. Cyprian and I'm wondering if there is a special prayer I should say. Should I put my intention on parchment paper under the candle and is there a foundation I can donate money to in his name for his help? I usually donate to St. Jude's Children's hospital for all the intentions that I make to St. Jude. Pray directly to your need to St. Cyprian and place it in a petition under his candle. If you are familiar with divination he can tell you what he can accept as an offering. Make sure you tell him that you are being oppressed by another practitioner and that you need his help. He usually works rather quickly to turn things around on your attackers. I haven't made a monetary donation for him, but if you feel like you want to then you might consider giving it to any Catholic organization or disaster relief as he works with disasters too. Thank you conjureman for your help. I'm not familiar with divination, but I'll do some research on it. I'll definitely add the name of woman in my petition when I light the candle today. Thanks again. He's the patron of spiritual workers so he generally works with such concerns. If you're under attack magically, spiritually, etc he can be of assistance. People will find that the saints will work on different matters depending on their relationship, but have a general office they adhere too. If you are seeking justice for a wrong that comes from another source other than magical/spiritual then you may consider working with another saint. However, you can also perform a divination and ask St. Cyrpian if he's willing to work with you on the case you have in mind. Foe those who are familiar with Saint Cyprian what does he accept for offerings generally? Your best bet is always just to ask the spirit what they would like - you can determine that through simple pendulum divination if you do not know a more complex system such as tarot, cards, etc. Definately ask the saint himself. Generally, I burn incense for him, leave him purple candles, water, and also surround him with books on the occult, some of my tools etc. I can not explain this. I just can't. This Saint reached out to me and I am receptive. I am thankful. That is beautiful to hear! Thank you for sharing this with us. You are as always so sweet spirited. I can feel you and your kindness. I am Blessed that is what I can say. This Saint is guiding me... I honored him today. He is showing and paving the way for my next chapter in life. That is as deep as it gets!!! I am happy to hear that you are working with this wonderful guide and saint. Praises to Saint Cyprian. Just finished reading this entire thread. Very enlightening. I believe this Saint is here to guide me into the next chapter in my life, the entire big picture of The World. Clear as a bell on what to do. I met someone yesterday a. New client and he shared a new prayer I have never heard before thought id pass it along.. There are actually quite a bite of novenas and prayers to Saint Cyprian. However they are almost entirely in Spanish or Portuguese as his presence is very big in countries that speak those languages. I am familiar with a few of his prayers and have translated some into English, but know that they are definitely out there. There are actually several books that are attributed to him as well. I was wondering if anyone knew where I can purchase a copy of this Saints Grimoire? I have been searching for Antigo Livro de Sao Cipriano, that is the name of the book but cannot find it anywhere in the states? This version is written in portuguese. Does anyone know if there is an english version out there? If not, the portuguese version is fine for me. He keeps entering my mind lately and asked a family member of mine who owns this book to lend it to me but was told that he is not allowed to lend the book out, only the owner of the book can read from it? There are actually a couple different books attributed to Saint Cyprian alternatively known as the Great Book of Saint Cyprian, the True Book of Saint Cyprian, the Verified Book of Saint Cyprian etc. Despite the name difference these books all have very similar spells written within and tend to trace their history back to Portugal and Spain. They are highly popular in South and Central America. There is another strain of books attributed to Saint Cyprian form Northern Europe, then there is the Grimoire of Saint Cyprian which is entirely different. Grimoire is a book of ceremonial magic where as the other books are filled with spells and forumlae. The works tend to be rather gruesome. While these books are attributed to Saint Cyprian they do not teach you how to work with him. Instead they give you a series of folk-magic works. None of the texts address how to petition him, work with him, etc. If you feel drawn to Saint Cyprian then getting the books of Saint Cyprian isn't going to draw you closer to him, instead looking at getting the text I wrote on the subject as it will teach you how to properly establish a relationship with him and how to petition him. If however you are simply interested in the spells then yes you'll have to settle for either Spanish or Portuguese versions. CM Ali has written a book about him. It contains a number of wonderful prayers and spells, including a novena, a mojo hand, uncrossing work. I highly recommend it. There are also some spells on his blog. St. Cyprian is very supportive of all types of conjure/occultism. He will drive you to accomplish what he thinks you are capable of in conjure. He will also help you eliminate any fear you may have of conjure. I didn't realize how much subconscious fear was holding me back until he simply made it go away. He doesn't advocate rashness, but he doesn't want you to take any crap. He is particularly good at sending away crossing and other practitioners' nonsense. He helps filter out the energy of Santa Muerte to manageable levels. People say she tends to "ride" her supplicants. My experience is that her energy, while the most exquisite cleansing, can drain your vitality if not handled correctly. After all, she is DEATH. St. Cyprian helps to manage it to healthy levels. Eventually you will get used to her energy. It also helps to change her water on a daily basis, and the water of any of your ancestors, to keep her candle lit perpetually, her food and tequila present, and some kananga water in a glass for her. When her candle goes out, I am extremely aware of the onslaught of all the crap she kept off me. LM has a chromo print of the saint. Prayer cards and statues are hard to come by, so for an image, that might be the way you will have to go. 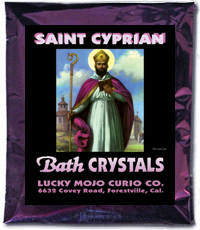 Of course they have St. Cyprian condition products, but I also recommend Master Key and Psychic Vision. You will also want to lay in a supply of charcoal tablets and frankincense resin, along with those purple candles that he loves so much. I have just read this answer by CMA and Joann Lee! Thank you both. CMA I want to learn how to work with him so your book will be perfect and I have to check out your blog, I must have missed them last time. I know what you mean about the spells. I read excerpts from the Antigo Livro de Sao Cipriano, the portuguese version, when I was very little and it scared me, it is pretty gruesome. The person in my family used to hide it under his bed and the text was in red and black. I know he(my family member) used a spell from it only once in his life to rid his life of an evil person that was out to get him and sabotage his life, within a month that bad person drove his car off a cliff. That was the one and only time he did any work from that book, spooked him for good. Yeah, the spells in there are a favorite for some countries. They are also pretty strong stuff in there. I always suggest working with him directly, he's a powerful saint.